STRESS is a major contributor to physical, emotional, and mental illness. 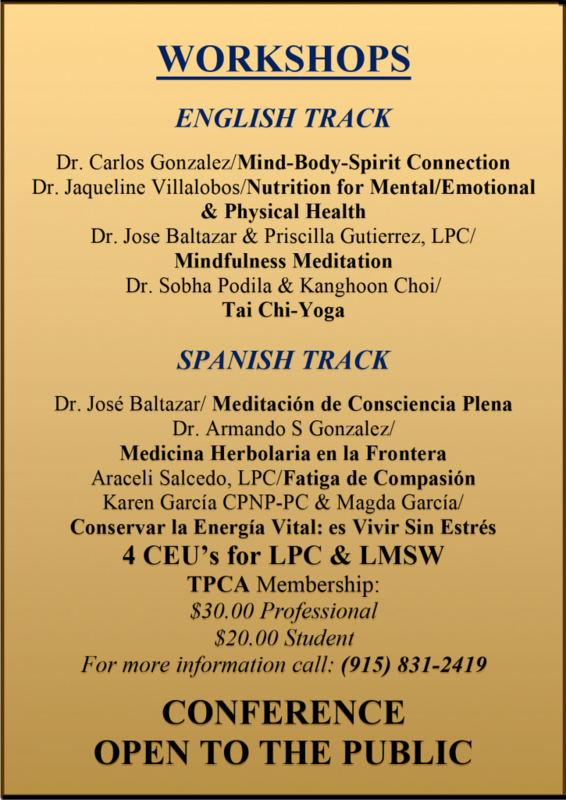 Participants will learn evidence based preventive Mind-Body interventions that promote health benefits and wellness. Thank you for participating. See you next year! Conference is organized by El Paso OASIS and Trans-Pecos Counseling Association (TPCA) who has over 100 members. 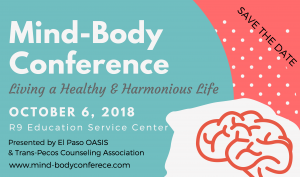 Last year’s conference drew mostly professionals from the Trans-Pecos Counseling Association and students seeking to further their understanding of Mind-Body and Integrative Medicine. Participants learned modalities such as Paleo Nutrition, Imagery, Laughter Yoga, and Energy Healing. Evaluations completed by the participants at the end of the event rated it high and comments were positive and encouraging.